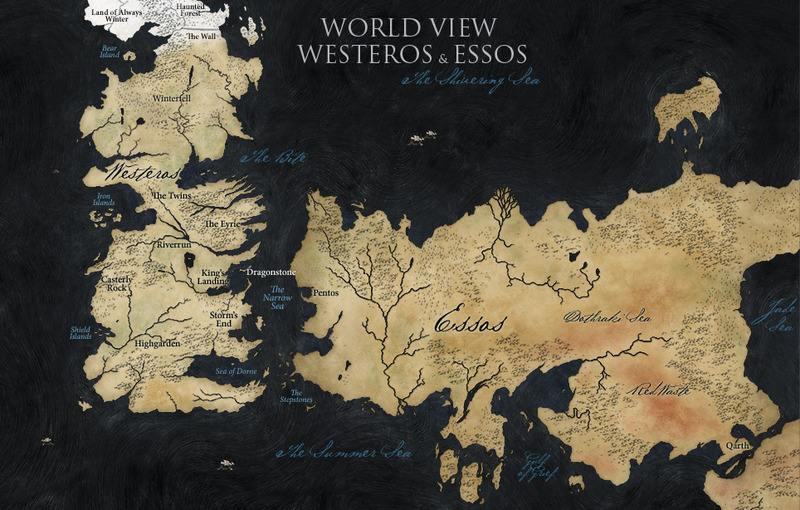 How did you find out that GRRM had re-conceptualized the Far East of Essos? I'd be curious to hear if he's dropped any hints about the changes. Going off the HBO map, the Jade Sea looks more like an eastward oriented Indian Ocean than the Black Sea, although it could be an issue of scale (i.e., we don't know how big Essos is compared to Eurasia). I can't wait until we get the map book later this year. That will resolve some of the questions for good. I'm still betting on the Jade Sea being a mostly contained body, because of the "circular" trade mentioned. Ran from Westeros has been helping check over the maps before they are published, and GRRM ran both the old and new versions of Far Eastern Essos past him. It's unclear if the current map is 'locked' (i.e. this map is now the canon map for the TV series, regardless of GRRM's changes) or if it will change to match GRRM's new maps when they are unveiled later this year. Since the map now contains everywhere that will be visited in ASoIaF/GoT (contrary to fanwank, I very much doubt we are going to Asshai outside of possible Melisandre flashbacks), HBO might just leave it. There are pretty large mountains where the Rhoyne and its tributaries flow out, the HBO map just makes them look like feeble hills instead. The big river in the Dothraki Sea does seem rather impossible, however. I do think it's cool that Martin still wants to keep parts of the world hidden. Ser Mountain Goat's map is very nice indeed, but strictly non-canon. The map in this article is canon to the TV series and the LANDS OF ICE AND FIRE map book due out next week is canon for the novels.